Even if she is a crummy Eagles fan, god bless 'er -- we still think she's about the best thing since sliced bread! 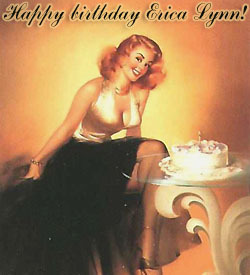 Happy birthday, Erica Lynn! (You're not old, by the way. Believe me, I can show you old...) Have a wonderful day! what'd you call her? a beagles fan? yeah, that's right. i said beagles. wanna make somethin of it?